I grew up in North Dakota, where the nearest “major” professional team was the Winnipeg Jets (the first incarnation, since obviously I’m kind of old) and it was a five-hour drive to get to the Twin Cites (which, at various points in my youth, had pro basketball and/or hockey but always the NFL and MLB). I attended my first Major League Baseball game and first major pro sporting event of any kind when I was 10. It was a Phillies vs. Pirates game in Pittsburgh as part of a road trip with my grandma to visit relatives in West Virginia. These were the predominant vacations of my youth: long car trips with grandma to visit relatives. Between age 1 and age 20, I was on an airplane one time. At that Phillies vs. Pirates game, I know we showed up as early as possible. I know I had my glove. I know I begged for autographs and was granted two: Lance Parrish of the Phillies and Hipolito Pena of the Pirates. Of the latter, I was not convinced he was a real player. I told my uncle: I think he’s just a guy in a Pirates uniform. I could not tell you exactly what happened in the game, but I know that it was thrilling and that I would not have ever dreamed of leaving early or not wearing a glove. I still have the baseball with those autographs on it somewhere. I went to my first Twins game at the Metrodome three years later. I was never a Twins fan growing up — the Braves and their powerful Superstation were my baseball passion, so while all of you have wonderful memories of the greatest World Series of all-time I still have Lonnie Smith night terrors — but going to the Dome still was a big deal. On that trip and every subsequent game at the Dome, I remember my mom messing up the exit and us getting hopelessly lost. (General North Dakota reaction to Minneapolis: Oh, you’re from Minneapolis? I don’t think I could live there. All the traffic). The Twins were a bad team when I first saw them. Best guess is it was 1989, right in between the World Series teams. Fred McGriff was playing for the Blue Jays and hit a home run that might still be traveling if not for the confines of the Teflon sky. The Twins lost by a million runs. But again, it was baseball. I was a junkie. I loved every minute of it, stayed for every inning, brought my glove, went early and dreamed of getting a batting practice baseball. I was 12 going on 13. Baseball was everything. I went to a few games on a few more trips to “The Cities” while in junior high and high school. Rocket, whom many of you know as a long-winded and shouty NHL guest poster, was there for at least a couple of the trips. Then college arrived. I went to the U, of course. Rocket made it down here eventually, too, and between us we saw an immeasurable amount of bad baseball in the mid-to-late 1990s. Sparse crowds. Bad pitching. At some point, we took to heckling — not the mean stuff, really, just thinking we were far more clever than we probably really were — to get us through. We’d pick an opposing outfielder (cheap seats thanks to discounted college nights) and go to work. In some cases, this player would turn out to have an unbelievable career night. This is exhibit A: Brian Lesher hitting a three-run homer to tie the game in the ninth and also making a game-saving catch for the A’s, though the Twins still won in the 12th. This was Sept. 12, 1996. Rocket and I were among the 9,712 paid. We were among the handful who stayed until the end, as we always did. At that time of our lives, where else were we going to go? I was 19 going on 20, still loved baseball and had no money. I wasn’t bringing my glove any more, but I was still after that elusive ball. A few years later, a group of us (including Rocket) started the annual Great Baseball Road Trip. I was at the Strib by this point and was covering a handful of Twins games (and not heckling from the press box) a year, including helping out with the 2002, 2003 and 2004 playoffs. In 2003, the Great Baseball Road Trip was a massive, sprawling 10-day excursion. I was dating my now-wife at the time. We had no kids and no mortgage. (We did have a young pug, Petunia, a dog we still have and who is now 12.5 years old. We charmingly called ourselves “dog parents” back then. Caring for a dog, even a puppy, as it turns out is about 1/100th of the work as caring for a child. But yes, we were dog parents). Still: Leaving for 10 days was not a huge deal. It was a once-a-year thing. She did her thing. I did mine. The logistics were easy. The final stop on that 2003 trip was Chicago — after a night in Madison, games in Cleveland, Pittsburgh and Toronto and an afternoon with four dudes at Niagara falls. It was an afternoon game against the Diamondbacks. The game started on time, then got clogged up by a three-hour rain delay in the late innings with the teams tied 1-1. We waited it out. I’m not kidding. Play resumed, the D-backs scored twice in the 11th and the Cubs matched. Finally, after 14 innings (and some heckles? The memory is fuzzy here …) the Cubs prevailed. We had been at Wrigley for nearly 8 hours. We were among a few thousand who stayed. We could all still do this because we were crazy and we had nowhere else of great urgency to be. As I’ve written before, those GBRTs used to be 7-10 day affairs. They gradually shrunk in size, then participants dropped off and rejoined until now there’s this: a four-day weekend, Thursday-Sunday, in which a core group crams in as much baseball and nonsense as possible. There are families to get back to, and even planning a four-day trip starts 6 months in advance (which reminds me, I should probably start working on next year’s trip pretty soon). On this year’s trip, we arrived late for at least two games (one of which was my fault because of a map error). What would have been an unforgivable sin 10 years ago was no big deal, even though we all remain huge baseball fans and I still remain in pursuit of that elusive ball. 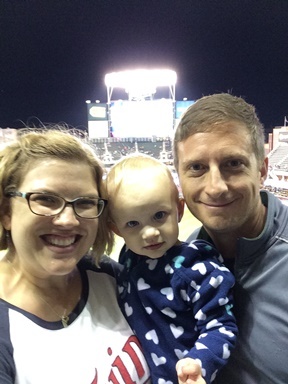 On Thursday, my wife and I took our daughter, Anabel, to the Twins/Angels game. It was Anabel’s third career game, but the first one at which she has had definite opinions about what she would like to be doing. She was 6 months old the first time and wasn’t terribly mobile; she was 15 months the second time, and though she was walking she could be placated for innings at a time by things like ice in a cup. Now almost 18 months old, the vast options of a ballpark can barely contain her. We arrived in the bottom of the 1st (as the Twins were scoring five runs). By the bottom of the second (after the Angels had scored six), the game was already more than an hour old. We made it through the bottom of the fifth, and the final two innings were mostly chasing Anabel around the concourse. In fairness, making it through five innings represented the 2 hour, 40 minute mark of that particular game. She did well considering everything.And so I left the game happy to have seen what I could of half of it. At some point, she’ll be old enough to sit through the whole thing. Maybe she’ll catch the bug like me and want to soak in every minute, batting practice included, and I’ll gladly join her.Maybe someday she’ll catch that elusive baseball that I’m now convinced will never come my way, no matter how old I get and how much baseball I watch.